Sport has a way with human emotions. It transcends geographical boundaries and let people enjoy and adore such great athletes with amazement. There are tournaments that are crown jewels in every sport and lift that particular sport by a few notches. Every football player who trades his wits in Europe wants to play in the Champions League. In Cricket, it’s about being part of a World Cup winning team. Wimbledon is one such event that catches the breath of the tennis world. You may be a winner of 3 other grand slams and World No 1 but you are not regarded as great until you walk out SW19 as Wimbledon Champion. So what makes Wimbledon special? Is it the place, the royals, the whites or the strawberries? The same set of players who compete in Wimbledon battle week in week out for the rest of the year. But why do great Champions cry in the post match presentation only at Wimbledon? What makes such legends like Sampras and Federer even at 30 years of age and 6 titles already in the kitty, come back and win it like it was their first? Why this romance with the tournament which first started as a fundraiser? When I first started watching Wimbledon, it was a time when Pate Sampras took over the baton from Boris Becker. When Pistol Pete, with his cool demeanor and a vibrant smile, broke down in the post match presentation, I wondered why a sports person would cry for winning a tournament. But it took me 9 years to know the answer when Goran Ivanisevic’s near impossible journey from a wild card ended as the new Wimbledon champion. When you look at someone like Sampras and Federer Wimbledon, you know that they are destined to be great champions there. Everything about them is Wimbledon. Quality. Class. Elegance. It was almost like a long decided arranged marriage, always meant to happen. But Ivanisevic’s was a love story of theatrical content. Before the final I was not thinking too much of Ivanisevic but by the third set in the final I was fully behind him and when he won even I had moist eyes. I didn’t know why but I realized that it must have been something special. His relentless pursuit to be a Wimbledon Champion showed why this is such a prestigious tournament. One of the reasons that I love Wimbledon was the fact that it encourages serve and volley – or it is supposed to, at least. In other grand slams, you don’t really notice the beauty of moving around the court like here in the lawns of SW19. 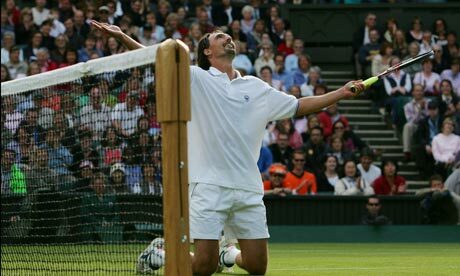 And it broke my heart when such a wonderful expert of serve and volley like Pat Rafter never won at Wimbledon. It also explains why someone like Ivan Lendl, a wonderful player otherwise, also never won the championships. Lendl was a force from the baseline but never good at the net and that cost him two finals. It takes a great player to master the uneven and sometimes nasty bounce of the grass and no wonder Wimbledon champions were regarded as greats. It’s what separates the men from the boys. Today tennis has changed to a more baseline play than approaching the net. The Australian Open produces slug fest every year with long matches but if you look closely, you will realize that fewer players approach the net to cut down the risk. But is that good tennis? I don’t think so. To me, it’s a horrible site to see men playing double-handed backhand. I will go any day to watch Federer and Sampras play against each other and create masterful angles with their single-handed backhands than a Djokovic – Nadal slug fest. Women’s tennis is even worse in this which explains why I like players like Navaratilova, Graff and Justine Henin. It’s a pity that Henin never won at Wimbledon despite that beautiful backhand which prompted John McEnroe to comment that it was on par with the men’s. Now, as Federer masterfully captured a record equaling 7th Wimbledon gentleman’s Singles Championship and Serena Williams her 5th, we take stock of what’s in store for the future of tennis. Sure the future of tennis looks good with the likes of Djokovic, Nadal and Murray. Women’s tennis, though has become a mostly two set contests, still manage to produce good players and beautiful players to keep it going. But are these players capable of being the great if not the greatest? When Boris retired Sampras rose and Federer took over after that ‘passing the torch’ 4th round match in 2001. But invariably we knew that it was passed from one great player to another. Now who is there to claim it from Federer? Is men’s tennis going to become like the women’s where a new world no. 1 emerges every few weeks just because there are no great players left? Are we going to be satisfied with baseline slug fest experts winning Wimbledon when there are no artistic masters left? Who is going to use the tennis racquet as a paint brush? Whoever does will make this great game even greater! Even Roger Federer would not want history to remember him as the last great player of the game. But until then, enjoy that awe inspiring tennis that the legend produces for you may see too few and too far once he retires. My love affair with Wimbledon started in 1991 when my first tennis hero – Boris Becker lost in straight sets to his German compatriot Michael Stich in the final. Stich? Does anybody remember him? Did he play tennis? The answers to the above questions are yes and he played brilliant tennis to beat Becker. Those were the first impressions of a tournament I have loved watching till date. I still distinctly remember how devastated I was on seeing my hero lose when the whole world expected an easy win. To see the headline – ‘Stich bombs his way to Wimbledon glory’ – in the newspapers the next day broke my heart. From then on I have followed Wimbled every year seeing Pete Sampras win 7 titles (I hated him for he was unbeatable and therefore invariably my idol Becker had no chance), the arrival of a new legend in Roger Federer, the almost magical triumph of Goran Ivanisevic in 2001 and many other unforgettable moments. So many memories are floating around my head as I write this but one moment which I will never forget has to be Greg Rusedski saving a match point against a fellow Brit with a second serve ace after his previous serve (which was a second serve too) hit the net cord and tantalisingly fell in. That image is still etched in my brain as Rusedski went on to win from the depths of defeat. Why did I choose that moment? Because till date I haven’t been able to get it off my mind. Yes it was not a big match, an unseeded was playing against a better player but it just stuck in my DNA. May be the sheer audacity of Rusedski to go for broke on match point just amazed me and it still does. There have been so many great memories and innumerable matches to pick – that’s the beauty of Wimbledon– it fascinates and thrills you like no other tournament. I grew up listening to Vijay Amritraj and, now, of late, Alan Wilkins. They are an irrestible combination and have certainly made watching the Championships more fun. I still remember how I would rush back from school to watch the start of every day’s action. My days would be spent in front of the TV watching the masters of grass battle it out. Ah! Those were the days when the tennis was of the highest quality (which is not to suggest that the quality has deteriorated now). I loved watching serve and volleyers – the likes of Edberg, Becker, Sampras, Ivanisevic, Rafter and many others. The standard of tennis and the quality of players on show then were of a far superior standard to what we see now. Back in the ’90s there was no clear favorite at Wimbledon– a handful of players could win it. That’s because they all relied on a big serve and then a sound volley to finish off points quicker. Sadly there is not a single serve and volley exponent in the game today and that really puts me off when I see baseline rallies dominating the Championships. It is one thing that has made Wimbledon watching a bit of a chore, but you still get on with it as we do with a lot of things in life. What makes Wimbledon special? Everything – from the green grass to the tradition, cream and strawberries, the Royal patronage, to the players impeccably dressed in whites. I could go on and on but this is a tournament which has no parallel. It is played in the English summer when the sun is out in full splendor and the tennis is of the highest standard. It is the only major played on grass. This is a difficult one to choose for there are many great memories. But I will go for one of the most incredible sporting moments which made every one emotional and some to cry their hearts out. It is the summer of 2001, and a certain Pete Sampras is gunning for his 8th title and there are a host of other contenders including the great British hope Tim Henman. Amongst all these contenders is a man named Goran Ivanisevic. He is a three-time finalist at this tournament but his ranking had plummeted to 125 which was not sufficient for him to earn an automatic place in the main draw at Wimbledon but, given his past record as a three-time runner-up, he was awarded a wildcard for entry into the singles draw. Surely Ivanisevic didn’t have it in him to defeat the likes of Sampras and Co. His ranking had gone down and he was playing badly. Still it was a wonderful gesture from the All England Lawn Tennis and Croquet Club to give him a wildcard. Nobody expected anyone other than Sampras to win it one more time. But 2001 was also the year when Roger Federer dethroned Pete Sampras in the fourth round which ended an era and heralded the beginning of a new one. With Sampras gone, the whole of Britain felt that it was the year of Henman. But the wildcard was making slow but steady progress through the draw. The aces were coming and in a rain interrupted semi-final Goran beat Henman to end the British dream. Coming into the final against Rafter – perhaps the best serve and volley player never to have won Wimbledon (add Mark Philippoussis and Tim Henman to that list) – Goran knew it was his final chance. His previous three finals had resulted in heart-break for the man from Croatia and here was a man who had another chance to realise his dream when he wouldn’t have expected it. In an epic final Goran won and the whole world enjoyed his victory. He was a loveable rascal and it would’ve been a pity had he not won Wimbledon. He had the game and the tools to win but always came short against a superior opponent. But in 2001 he was not to be denied. Why is Ivanisevic’s victory so special? Because even as a true neutral that day it would’ve been impossible not to get emotionally swayed by a man who wanted the trophy so badly that he later remarked that he may have shot himself if he had lost for a fourth time. The drama, the tension and the accompanying anxiety following his progress to the title certainly didn’t make me any younger. But it was worth it and maybe it was just destined to happen after all those initial disappointments. So what does 2012 hold out? I expect another Djokovic v Nadal final. Don’t read too much into Nadal’s loss at Halle. He is a different beast when it comes to the majors. I also have a sneaking feeling that Tsonga might be one of the dark-horses. He has the game and the will to win. It is all a matter of getting it right on the big stage against a big player. He has done it before (last year v Federer). So it wouldn’t surprise me if he wins it this time. Some of the biggest names in cricket, of all time, are represented in the Indian and Australian cricket teams. Yet, as cricket chugs on to 26th January – Reuplic Day for India and also Australia Day – it is difficult to imagine many excited about cricket. With Australia also offering a colossal battle between Nadal and Federer for the 27th time, it is hard to believe cricket will be fans’ top priority even among stout Australian fans who are witnessing a great run by their team. Rivalries elevates sport to a different level, a level that stretches physical limits and collective beliefs. Federer might have fallen off the perch and Nadal no longer the king, but when they clash, tennis reaches a level that can rival any art at its best. Australia and India always produced close contests. And the rivalry defined the highest level of cricket in the 2000s, but the last three series have been flat with the odd throwback to brilliance, but this series has been poor. A day, when a past champion and a young captain who currently ranks to be as good as any one going around, thwarted an attack that had plans, but none else, it looked nothing like Federer vs Nadal or Brazil vs Argentina. It did not even resemble Sampras vs Agassi on the seniors’ tour. One team had plans – Ishant bowled outside off, Umesh tried his best to rough the batsman up, Zaheer tried his various tricks and Ashwin his various spins – and constructed its points like a good tennis player would, but would find the winner coming from the opposition. Sometimes, luckily so, but mostly through sheer brilliance from the opponent. The day belonged to a champion who is past his prime, but one who has shown ability to graft and bide his time that was considered too passe to him not so long ago. 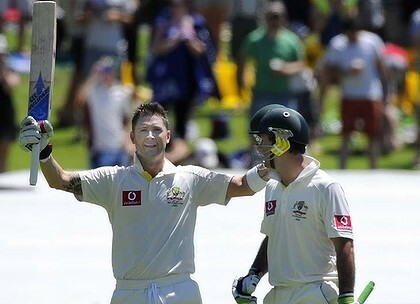 His determination, mostly, and his change in his trigger movements, to a lesser extent, have turned around his summer in to perhaps a couple more Australian summers . Sadly, neither the determination nor the desperation is to be seen in the visitors’ camp. There is little to suggest that the Indians tried anything different in their planning or preparation in the long break between the Tests. It is clear that the routine that has not been good enough so far is being persisted with. Indians lacked plans and direction when partnerships flowered in Sydney and Perth and now here in Adelaide. Captains and bowlers seem clueless and the fielders seem a dispirited lot. But none of those mattered to Clarke. He was earmarked as a young player with quick feet and sharp brains. His handling of his side – the veterans and the youngsters – has been remarkable. More so, he has found his best form with the bat and is having the best summer of his life. Though his batting this summer is nothing short of astonishing, it is his personality as a skipper and a leader that has outshone everything else. As Australia Day and Australian Open beckons, as Australia and Clarke push for glory, as India’s summer spirals out of control like a Formula One car on gravel, when Gambhir and Tendulkar resume their battle, Indian fans might flip channels to see Federer or Nadal in action, but will hope, even if for a fleeting moment, that they see a fight. Not a Tendulkar rampant half-century, but a grinding and stone-walling ton. Not a Gambhir with flashing blade and a loose mouth, but a stodgy and determined Gambhir. Not a Laxman with the languid drive and an airy flick, but the Laxman who produces his best when his team needs him the most. The rivalry is no longer Federer-Nadal class, but should it even match the Sampras-Agassi levels in a seniors’ tournament, it might be worth the while. The hope of putting up a fight is all that remains. “Djokovic’s gluten free diet may have revolutionized tennis this year, but, I believe my journey to the top has already begun with my new found diet – full Andhra meals!” announced Nadal in his tennis school in Anantapur, India on Tuesday. Just days after leading Spain to another Davis Cup title to finish a largely disappointing year on a high, Rafael Nadal, is in his tennis school in India to plan and prepare for 2012. It is no secret that Roger Federer and Rafael Nadal are the two greatest players of this era and rank at or near the top in the list of all time. It is not difficult to see how Andy Roddick would have won multiple Wimbledon titles, or Andy Murray would have ended the British drought if it were not for these two men. Novak Djokovic himself struggled to compete against the two for a while and has gradually improved himself to the point where he is almost unbeatable against the two — well, everybody. Look at how he monumentally increased his performance at majors this year. First, he beat the defending champion, Federer, in Melbourne. Then he beat Nadal, again the defending champion, at Wimbledon. To top it off he beat both, Federer and Nadal, at New York. I have mentioned many times that the Miami finals this year was the turning point in the rivalry. Actually, the trivalry. He beat Nadal at his own game — by outgassing him in the final set tie-breaker. Even after beating Nadal four times in the Masters, we still thought that is a different task to take three sets off Nadal in a major final (Nadal had lost just two major finals before this year). He did that at Wimbledon. Today, he completed his dominance over Nadal. A scoreline of 6-2 6-4 6-7 6-1 loos like a routine four set win, completed somewhere around 3 hours. It was anything but. The actual time of this match was north of four hours spanned over 268 points. Most of those 268 points were contested in brutal, physical rallies of the highest magnitude, ones which we have rarely seen. Each point had to be won two, three or four times. One of these games lasted 17 minutes and rarely was there a game not going to deuce. They battled from the baseline, came to the net to hit volleys, were lobbed and had to scramble back to start the point over …. I can go on. The physicality of this four set match was even more than most of the five set epics that Rafa has played in his career. In the past, Rafa had made a career on outlasting his opponents. After magically winning the tie-breaker with his extreme fighting ability, he had finally turned this match into a physical battle. Djokovic called for the trainer and did not hit a first serve above 100mph thereafter. Everybody thought Rafa would take the match in five. Except Rafa, that is. Because he used his entire fuel tank to bring cramps on his gulten-free opponent. When Djokovic hit the final forehand winner, Nadal did not make an attempt to reach for it. The tireless opponent was also robbed off every ounce of mental energy by then to fight any longer. mere luck. When Nadal’s signature serves wide from the ad court are blasted for return winners, you know you are witnessing something special. It might not be an overstatement to say that Djokovic did a great job “holding” his return of serve. The most scary statistic: Nadal lost every second point on his first serve. And this was when Nadal was not playing bad himself. He broke Djokovic six times in the first three sets and saved 15 break points. Even though his backhand was no match against Djokovic, he kept himself alive in rallies using great combination of slices, forehands and change of pace. 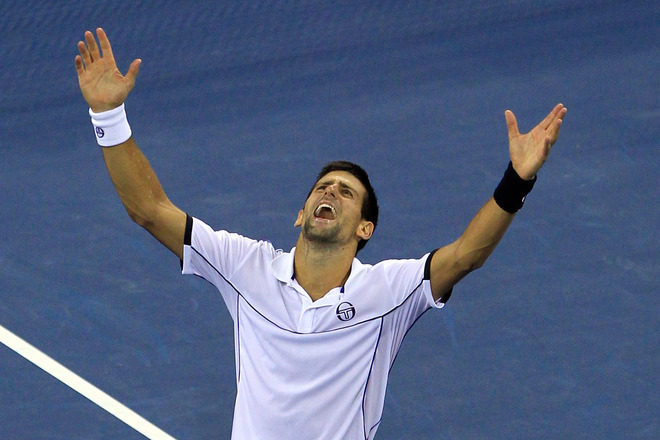 He fought from the deepest hole when Djokovic was serving for the match in the third to extend it for another set.